From the US, head north on Highway #20 toward the international border. Newport to the Canada/US border is 117 km / 73 mi. The town of Tiger is located at the Highway junctions #20/31 and is the gateway to the North Pend Oreille Scenic Byway. The Tiger Historical Centre & Museum began as a 1912 general store. It offers historical displays, local art and a working turn-of-the-century forge. From Tiger, head north on Highway #31. Metaline Falls is known as one of America's Top 100 Best Small Arts Towns. It is home to the Cutter Theatre, a 1912 restored schoolhouse. Other Metaline attractions include the Mill Pond Historic Trail and tours of the Gardner Cave. Nelway to Nelson is 55 km / 34 mi on Highway #6. Salmo has a fascinating gold rush and logging history that is celebrated in the town's famous stone murals and historic mining museum. Ymir is a tiny authentic mountain community with a store, bakery, two hotels and the beautiful Logden Lodge. Nelson boasts a vivid past of Victorian architecture, cultural histories and a vibrant art scene. 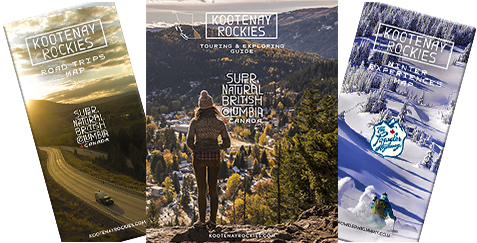 These qualities are complemented by world-class outdoor adventure plus great dining, shopping and lodging options. Ride the Streetcar #23 tramway at Lakeside Park & Prestige Resort. Wonderful farmers markets take place in summer every Wednesday and Saturdays. Nelson-Salmo Great Northern Trail is a gentle rail bed that allows biking. Nelson to Balfour is 34 km / 21 mi on Highway #3A. West Arm Provincial Park is largely undeveloped and popular for activities such as fishing, hiking and swimming. Kokanee Creek Provincial Park offers camping and hiking. On the road to Kokanee Glacier Park is where a zipline attraction is located. Balfour has many visitor amenities and is the location of the Kootenay Lake Ferry. Take the world's longest free ferry ride from Balfour to the village of Crawford Bay. Continue on Highway #3A south to Creston, alongside the east shore of Kootenay Lake (78 km / 48 mi). Crawford Bay is home to many unique artisan shops and galleries. The Glass House, near Sanca, was created from over 500,000 embalming fluid bottles. Upon your arrival to Creston, watch for signs to the Creston Valley Wildlife Area. Take a stroll along the wetland on a boardwalk to a multi-level viewing tower. Enjoy birdwatching, wildlife viewing, hiking and canoeing. Creston to Rykerts on Highway #21 south is 13 km / 8 mi. Porthill to Bonners Ferry is 44 km / 27 mi. Bonners Ferry to Sandpoint on Highway #95 is 52 km / 32 mi. Bonners Ferry is popular for its year-round outdoor recreation and charming historic downtown. The Kootenai National Wildlife Refuge hosts birds, mammals and fish, and offers a 6 km / 4 mi auto tour tour. Sandpoint has a lovely setting on Lake Pend Oreille. Watersport enthusiasts explore this vast playground. Lake Pend Oreille Cruises offer tours from City Beach. Schweitzer Mountain Resort offers year-round activities. Biking and hiking are popular in summer. The restored, historic Spanish-style Panida Theatre is a vibrant centre for performing arts. Sandpoint back to Newport on Highway #2 is 45 km / 28 mi. Priest River offers a museum and Timber Education Centre which displays historical artifacts from the logging industry as well as early pioneer family furnishings. Take a side trip north on Highway #57 to the resort communities of Priest Lake to spend a day at the beach. The Priest Lake area is also known for their premier huckleberry and mushroom season - many of the restaurants offer delectable dishes. Once back on Highway #2, continue west to Newport, a town with a heritage rich in timber, mineral and agriculture. Visit original structures such as the Northern Railway Depot (1908) that houses the Pend Oreille Country Historical Museum. This completes the Selkirk Loop. Pick up a free Selkirk Loop Travel Guide at any of the visitor centres around The Loop or visit the website (link above) for information on 6 Super Side Trips. The heritage city of Nelson welcomes you. A sunset at Kootenay Lake. Kokanee Springs Golf Resort in Crawford Bay. Kayakers alongside the Osprey Ferry on Kootenay Lake at Balfour. Listen to: City of Nelson history.